A large prosperous downtown church had three mission churches under its care that it had started. On the first Sunday of the New Year all the members of the mission churches came to the city church for a combined Communion service. In those mission churches, which were located in the slums of the city, were some outstanding cases of conversions—thieves, burglars, and so on—but all knelt side by side at the Communion rail. On one such occasion the pastor saw a former burglar kneeling beside a judge of the Supreme Court of England—it was the judge who had sent him to jail where he had served seven years. After his release this burglar had been converted and became a Christian worker. Yet, as they knelt there, the judge and the former convict neither one seemed to be aware of the other. “Yes,” the judge replied, “it did not cost that burglar much to get converted when he came out of jail. He had nothing but a history of crime behind him, and when he saw Jesus as his Saviour he knew there was salvation and hope and joy for him. And he knew how much he needed that help. “But look at me. I was taught from earliest infancy to live as a gentleman; that my word was to be my bond; that I was to say my prayers, go to church, take Communion and so on. I went through , took my degrees, was called to the bar and eventually became a judge. 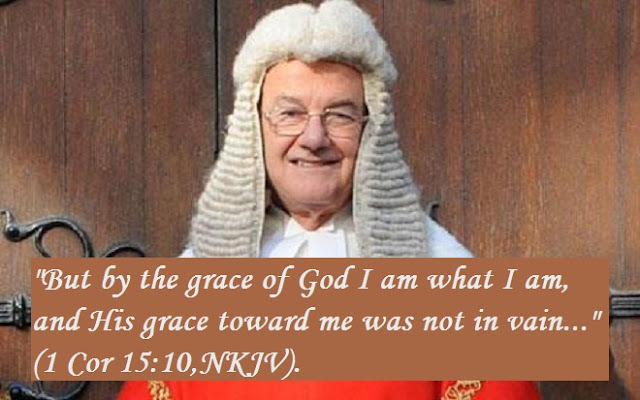 Truly I agree with the judge who has revealed a mighty truth by saying that the good man needs more grace of God than a bad man to realise that he is a sinner in need of a Saviour. It needs a great amount of humility for a good man to accept that he is equally a sinner like any other sinner who may be considered by all to be the worst of worst in the world. Jesus agreed with this statement and said to the good religious Jews, "... tax collectors and harlots [i.e. worst of worst sinners as the society considers them] enter the kingdom of God before you." (Matt 21:31,c). In other words Jesus agreed that the worst sinners easily entered in to God's kingdom by humbly acknowledging that they were sinners in need of a saviour than all those great religious so called good men who never felt that they were sinners at all. It took a lifetime of God's grace to bring a beautiful work of graceful spiritual art by God in the life of Paul the Apostle, who was a former Zealous Pharisee who persecuted the Christians, to finally say a few years before his death, "This is a faithful saying and worthy of all acceptance, that Christ Jesus came into the world to save sinners, of whom I am chief." (1 Tim 1:15). I myself have been realising this great truth day by day lately these days through the grace of God. Born in a good Christian home made me always think that I am a good person. This thinking deceived me to be a spiritual beggar until God by his mercy started to break me to reveal His truth in me. May God break all of our prideful thinking and make us realise our inner spiritual poverty and our need for our saviour JESUS always in our life (Matt 5:3).